Six comfortable, well-equipped log cabins spread along the wooded bank of the River Earn, offer an excellent base for touring from a comfortable relaxed base. £175 to £695 per week . 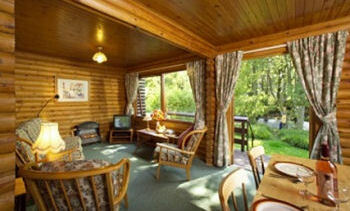 Six excellent log cabins sitting on the bank of the River Earn, offer an excellent holiday base. 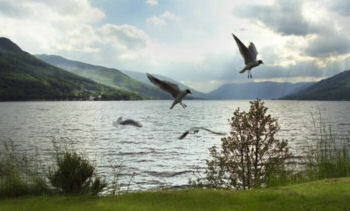 Water skiing and sailing can be enjoyed on Loch Earn. Tennis, swimming, bowls can all be found in Crieff, just 10 miles away. There are numerous local golf courses in the area. There are opportunities to eat in, utilising our modernised kitchens, or to enjoy the variety of local hotels and restaurants, cafes and pubs. The lounge has satellite television, video player, CD and radio. The bathroom has a bath and power shower. 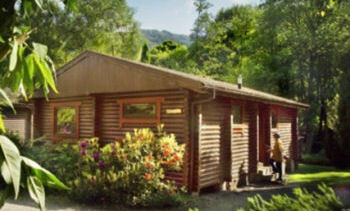 The log cabins sleeps six in three bedrooms, double, twin and bunk room (with full length bunks). There is a deck facing the river, picnic bench and barbecues for each holiday cottage. 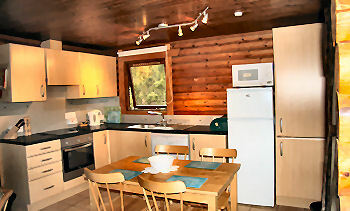 The cabins are maintained and cleaned to a high standard under the personal supervision of the owners.